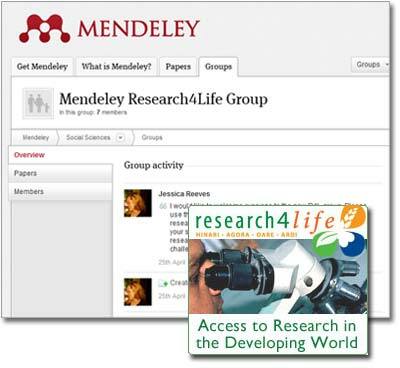 On the heels of its one-year anniversary at Elsevier, Mendeley, a global research collaboration and reference manager platform, has pledged to actively support and collaborate with Research4Life. Research 4 Life is a public-private partnership that provides free and low-cost access to peer reviewed resources. 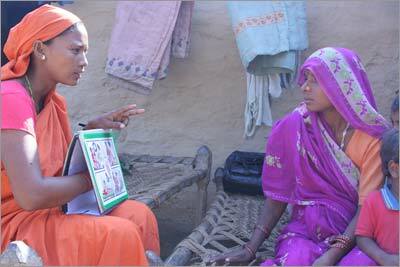 Its main challenges are boosting usage and output by researchers in developing countries. As one of the founding partners, Elsevier supplies a quarter of the content, but this is where Mendeley's research tools can really make a difference. Mendeley's free cloud-based apps will enable researchers to organize, share and discover new research with other scientists all over the world. Within Research4Life countries, Mendeley currently has thousands of active researcher users and hundreds of global Advisors to help train, educate and increase awareness about how make the most of these research productivity tools. "Since Mendeley was acquired by Elsevier last year, we've been excited about the possibility of getting more deeply involved in Research4Life," said Jan Reichelt, Co-founder and President of Mendeley. "It ties in closely to Mendeley's original vision of making science more open and broadening access to scientific content where it can make a real difference to people's lives." He explained how Mendeley will be able to help the researchers who use Research4Life. So far, researchers on the program have been using uneven solutions involving various workflow and citation management tools, but these are often expensive, and if you're trying to collaborate on a joint project with a researcher who doesn't have the same tool, that can be really problematic. We're hoping that Mendeley, with its vast community of researchers worldwide, will help to really facilitate and accelerate the pace of discovery for Research4Life scientists. Jessica L. Reeves, Mendeley's Head of User Engagement and Research4Life Mendeley liaison, said their goal is to educate users through Mendeley's Resource Center and grow the global Mendeley Advisor community to support researchers in developing countries. "Through our community, we plan to celebrate and promote Research4Life stories of success and collaboration and connect researchers who might be working on the same problems in different parts of the world," she said. Research4Life is a public-private partnership targeting the UN Millennium Development Goals by reducing the digital divide between industrialised and developing countries. It brings together institutions from across government, academia and industry such as (to name but a few) the World Health Organization, the International Association of Scientific, Technical and Medical Publishers, the Food and Agriculture Organization, Microsoft, the World Intellectual Property Organization, Cornell and Yale Universities, and approximately 200 publishers, who provide accessible scholarly content to over 7,000 institutions worldwide. It's one of the many initiatives supported by Elsevier that helps researchers get access to — and use — the information they need in places where resources are often scarce or hard to get to. There are over 40,000 peer-reviewed publications available through Research4Life, with Elsevier a quarter of those through Scopus and ScienceDirect, including about 3,000 journals and 12,000 books. In 2013, over 3 million articles were downloaded by researchers from ScienceDirect. 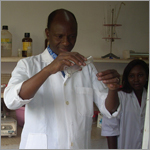 Since launching in 2001, the program has expanded to four targeted areas, supporting crucial research in health (HINARI), agriculture (AGORA), the environment (OARE) and development and innovation (ARDI). Elsevier has committed to providing the program with free or low-cost access to this content until at least 2020. 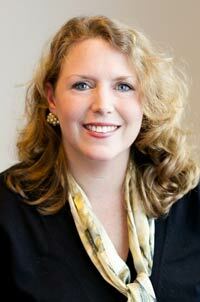 In addition, Elsevier provides strategic, technical and communication expertise that helps advance Research4Life. For example, the Elsevier Foundation's Innovative Libraries in Developing Countries Program gives grants for programs that build the infrastructure, improve information literacy, and provide training boost usage of Research4Life resources. Ylann Schemm (@ylannschemm) heads Elsevier's corporate responsibility program, which focuses on advancing women in science and developing research access in the developing world. She serves as the Program Director of the Elsevier Foundation's Innovative Libraries in Developing Countries program, which supports capacity-building projects in science, technology and medicine and chairs Research4Life's communications and marketing team, which seeks to raise awareness and usage of the programs.